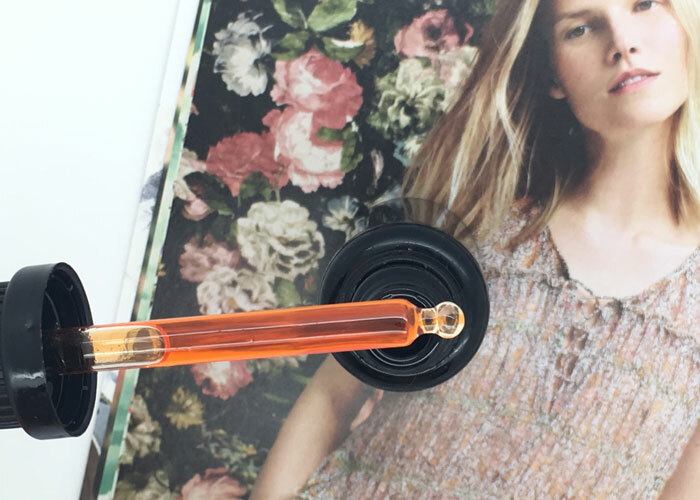 With its stunning coral color and satin-skin texture, Maya Chia’s Super Couple Ultra Luxe Face Oil Serum stands out in a growing sea of beauty oils. Described as a “multi-correctional high-performance ultra luxe face oil,” The Super Couple combines astaxanthin, a powerful antioxidant, with chia seed oil to deliver potent protection to your skin every single day. What’s impressive about The Super Couple and its marketing of these star ingredients is that both chia and astaxanthin make up the base of the oil; they are ingredients 1 and 2 in a very beautiful blend of skin-loving, luxurious ingredients that would turn even the most seasoned skincare lover’s eye. My eyes (and nose) perked up at the sight of jasmine absolute (ingredient 3) and rose absolute (ingredient 4), which are known for both their skin-softening and aromatherapeutic effects. A host of beneficial essential oils, including carrot seed, lavender, frankincense, myrrh and chamomile, offer soothing and antimicrobial benefits to the skin — especially acneic skin like mine. These scents, in a base of chia seed oil, create a slightly nutty, slighty floral and herbaceous scent. It’s quite neutral and fades very quickly upon application. No single scent, besides softened chia, dominates the profile. All of these ingredients come together without creating a dense, oily treatment. Instead, you get a true sink-into-your-skin oil that absorbs almost as fast as you press it into the skin. I use 6 drops onto freshly misted skin and never see a massive shine or feel overly oiled-up at all. That makes this oil perfect for daytime use — and you will want to use it every day once you understand the power of this oil’s breakthrough ingredient. Astaxanthin, one half of the so-called “super couple,” is carotenoid with extremely high antioxidant activity to combat free radicals caused by environmental stress. It’s said to perform 100 times better than vitamin E and has great potential for fighting UV-related skin stress. It’s also been clinically proven to have 65 times the strength of vitamin C to fight free radicals. Whoa. Chia oil, the base of this blend, is a rich source of omegas, antioxidants and minerals. It’s a smart choice to carry astaxanthin and the mix of essential oils and absolutes. Its lightweight texture and abundant benefits keep the oil feeling simple and minimalist while delivering complex results. I can say with confidence that improvement in skin texture is legit with this oil. My skin felt and looked radiant with everyday use. That pretty pink color seemed to also serve as a base “glow” to my overall makeup routine; no need for additional highlighters when using this! With regular use, I can see how this oil could help with providing a more even skin tone and brightening. Testing over six weeks doesn’t provide enough time to see drastic results, but the first step in seeing results is using something regularly. 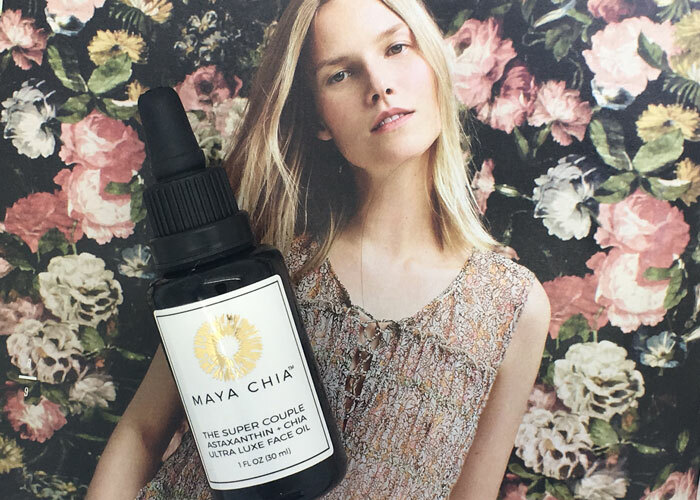 And Maya Chia’s The Super Couple is a face oil that you can’t help but reach for every day! I also agree that it’s deeply nourishing to the skin; it feels like second skin when applied, and absorbs so quickly that you can even apply another round of face mist and a few extra drops if you need a second boost. It never felt greasy and I never looked shiny in this oil. At $85 for one ounce, it’s reasonably priced in a very competitive luxury green beauty market, but not completely out of reach. At 4-6 drops a day, it should last several months. Because of this, Maya Chia’s The Super Couple is an absolute repurchase and recommend. The inclusion and science behind astaxanthin is impressive, especially for someone like me who is very hell-bent on getting vitamin C in my daytime routine. Perhaps I will now demand astaxanthin in everything I use?! I smell an ingredient trend about to boom thanks to Maya Chia. Have you tried anything from Maya Chia? What interesting ingredients have you been experimenting with lately? Tell me in the comment section!